I wonder if Robinson Crusoe, rumored to have spent his legendary days on the bigger sister of this island, ever saw and felt the scene before me. Hardly breathing, I scoot to within a few feet of the pair. Two sets of eyes like polished onyx peer unblinking from beneath the broad sheltering leaves of an Anthurium. The contrast of brilliant white plumage and red-orange bill against the muted greens and browns of the undergrowth makes it tough for my quarry to hide. A hungry Crusoe probably would have been a real threat to these vulnerable, trusting creatures. Fortunately, I'm the only potential predator on the island, and the only shooting I'll do today is with a camera. 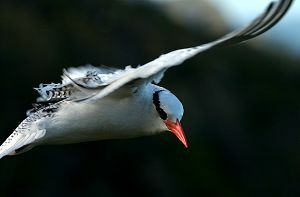 My subjects are the Red-billed Tropicbirds who nest here from November to March. I'm spending the day on Little Tobago. Close encounters with wildlife are getting rare in our expanding world of industrialization and urbanization. 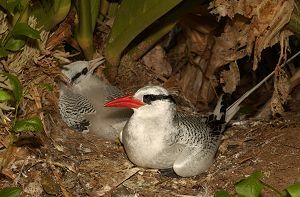 Little Tobago is a sanctuary for seabirds. Here they are safe from pollution and bulldozers. The island is also a sanctuary for me. Here I can forget for a few hours. Here I can step outside time and enjoy the presence of creatures that have little experience with people and no particular reason to fear them. Here I can sit and watch and wonder and give a prayer of thanks to Crusoe's God for the beauty around me. The island of Little Tobago sits off the northeast coast of Tobago in the West Indies. My journey this morning started with a rocky 15-minute boat ride from the fishing village of Speyside. 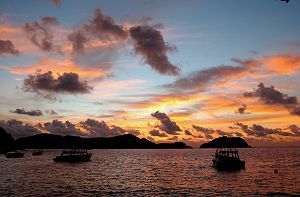 The glass-bottom boats depart twice a day with a few visitors who want to hike on Little Tobago for an hour, catch glimpses of corals and fish through the bottom of the boat, and spend half an hour of snorkeling around tiny Goat Island. Many tourists seem more interested in the impressive house on Goat Island than in the countless species of fish, the largest brain-coral in the world, and the occasional manta ray. The house, besieged but not taken by the twice-a-day tide, once belonged to Ian Fleming, creator of James Bond. For me, the boat to Goat Island and Little Tobago is just transport to the place of my escape. I've seen Mr. Fleming's house and the brain coral a few times before and had a great underwater experience yesterday with a local dive guide. 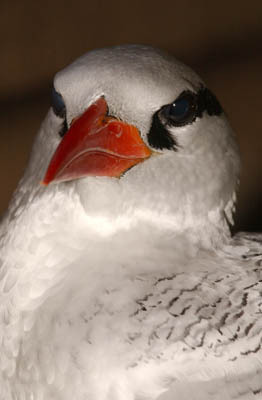 Today I'm fixed on my goal, to photograph nesting Red-billed Tropicbirds. The guides will give their little tour to the uninitiated but I will leave them for trails less-traveled. Most visitors stay just long enough to learn that the birds aren't all seagulls and then they leave, but I'm arriving on the first boat of the day and I'll leave on the last, with six hours or so of solitude in between. 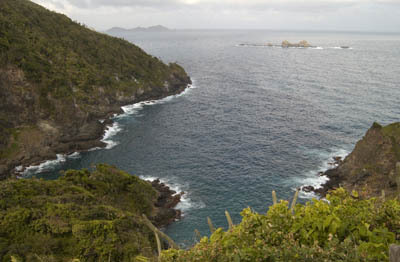 Little Tobago juts out of the sea steeply. Waves out of the Atlantic pound its rocky shores while wind-blown foliage including strange cacti conforms to the will of a persistent wind from the east. Forests of fan palms and hardwoods with a sparse ground cover of broad-leaved Anthurium fill in the leeward hollows. Numerous trails provide many hours of moderate hiking and I take to these with a long, eager stride. 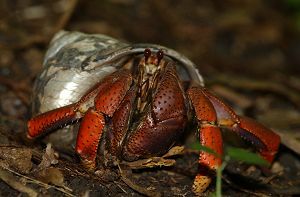 I share the trails with an odd assortment of hermit crabs, lizards, and feral chickens. None are in any particular hurry to get out of my way though none are bold or stupid enough to ignore my presence. 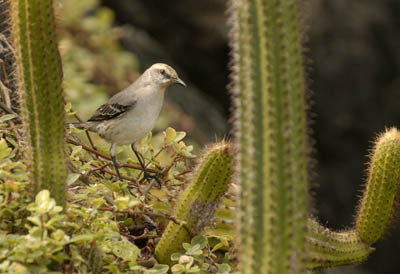 Tropical Mockingbirds, Blue-Crowned Mot-mots, and several species of passerines chatter as they flit by or watch silently from branches. 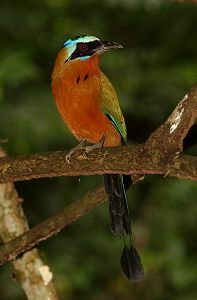 Birds of Paradise from New Guinea were introduced here many decades ago, giving Little Tobago its earlier name of Bird of Paradise Island. But now they gone, wiped out in a hurricane in the sixties. A twisted chain-link cage next to the trails speaks of an unsuccessful reintroduction program. 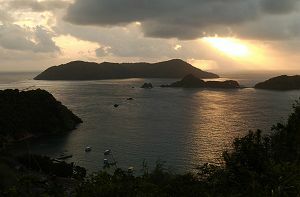 Little Tobago is what it is and seems to resist our efforts to change it. Finally reaching a crest with a view to the east, the sun and wind create a dazzling view of the heaving sea a hundred or so meters below me. 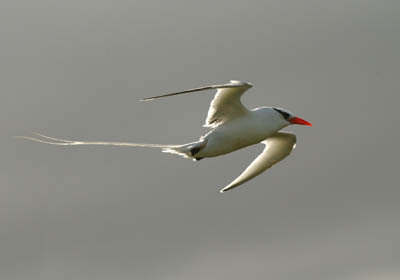 A few tropicbirds, boobies, and frigatebirds soar on the updrafts, but I know the skies will be riotous later on when the masses return from their day of foraging on the open sea. 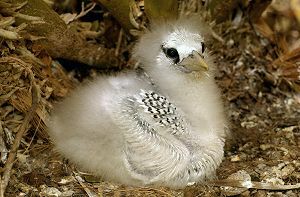 Still I can't help but stop and watch a few of the graceful white tropicbirds as they hurtle past, their tails as long as their bodies and beaks the color of hot coals. I recall hearing that this was the spot where David Attenborough's team filmed them several years before. A quick sip of water, and I'm off into the forest again. Approaching another crest, well away from the tourist route, I slow and begin to scan the forest floor for bits of white. A few snowy feathers beyond a fallen log catch my eye and my heart beats a little louder as I try to get a better viewing angle. Finally there's an opening in the leaves and we see each other. No one runs away. I'm allowed to watch on a trial basis. The next hour with these two perfect creatures will pass in a blink and be enjoyed for years as a memory and a few photographs. Even if Robinson Crusoe never did see this, being here, saturated in the Tobago experience, will surely animate my next reading of Defoe's account.